In this article I have mentioned how to make beautiful Rangoli designs paper stencils in some simple steps.You can follow the below instructions step by step and make your own.Observe all the steps below and make your own beautiful Rangoli designs paper stencils. It is very easy to make paper stencils of beautiful Rangoli designs and by this its very easy to make beautiful and attractive Rangoli design. By this your children's can also make beautiful Rangoli designs just what they need a creative mind or just observe the steps given below. Feel free to print the attached images and the below instructions. Step 1 - You can use a normal A4 size paper or a drawing sheet or crap paper to make stencil, So here in first step make a center crease and fold upwards as shown in picture. Step 2 - Fold towards as shown in picture. Step 3 - Then again fold corner to corner as shown in picture. Step 4 - Now by pen or sketch pen make a creative design on the paper and cut out the inner shaded part as shown in picture. Step 5 - Cut the shaded part very neatly and you will get something like shown in picture. 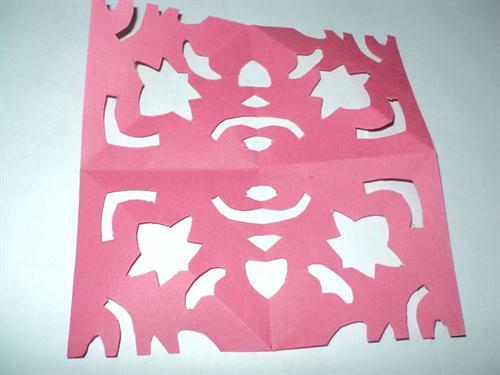 Step 6 - Now open all the folds that you made and finally your beautiful rangoli design paper stencil is ready to use. Step 1 - As we used above here also you can use a crap paper or drawing sheet, So here in our first step make a center crease and fold it upwards as shown in picture. Step 3 - After folding it you will get something like this. Step 4 - Now you have to make an creative design using sketch pen and cut out the inner shaded part as shown in picture. Step 5 - Cut the inner shaded part very neatly and you will get something like this as shown in picture. 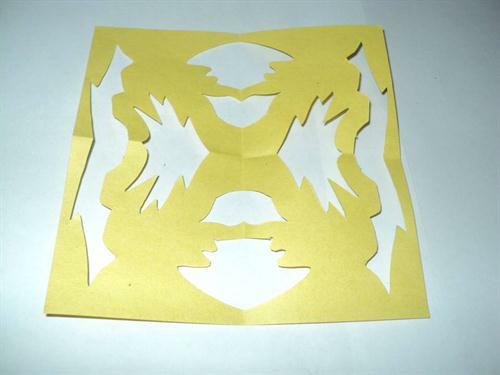 Step 6 - Now finally your cool Rangoli design paper stencil is ready to use. You can make many more such Rangoli designs paper stencil, just use your creative mind and make your own. For more worksheets and activities keep visiting this website.